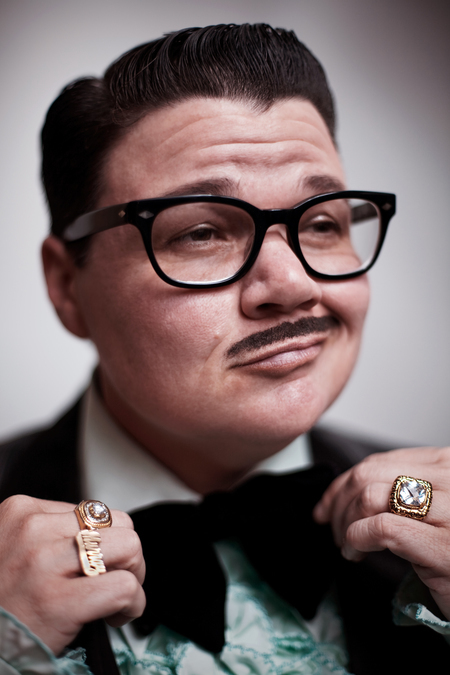 As the self-declared “hardest-working middle-aged man in showbusiness”, Murray Hill is a compelling cocktail of throwback and progressive, deconstructing the song and gag-cracking, sharp-suited lags of the Borscht Belt and Vegas through the vessel of drag king. Despite his disdain for a “basement … bunker” venue that's many miles from the glamour of Manhattan, he declares it a safe space, where the current president of the United States will not be mentioned. Yet with lounge lizard opportunism, a woman in the front row can be hit on for a kiss. Hill's career comfortably pre-dates the #MeToo and #TimesUp movements. But it's bang on zeitgeist for current debates about gender and sexuality, playing games across the spectrum of identity with charisma, self lacerating wit and just a hint of radical edge. Unlike the golden age turns he pastiches, Hill is voluble about his drug intake and has embraced the mobile phone age, instructing the crowd to take pictures, an oddly anachronistic spectacle. In terms of the act, there's a couple of opening and closing numbers. But the bulk of the hour is given over to Hill disassembling his lovelorn self and corralling the crowd in hastily conceived dance-offs and uproarious, getting-to-know-you chit-chat. Notwithstanding an opaque origins song about his gender transition, dressed up as a love ballad, scripted, About To Break wouldn't stand up to scrutiny. But as an MC, Hill is excellent, never letting his meagre material detract from an hour that's fun and inclusive above all else.